The better of two poisons? The mind went back a decade to Andy Farrell's last serious game of rugby league, for Great Britain against Australia in the final of the tri-Nations at Elland Road. Half an hour in, with Australia running amok on the back of a Darren Lockyer masterclass Dave Hadfield, perhaps the finest active writer on either code, ruminated aloud that "I think I'm beginning to prefer the other script, when they do us in the last minute". Watching Wales play the two southern giants against whom they reckon to have a chance during the Warren Gatland era has been to make a choice between two poisons. Is it worse to be tantalised by the Wallabies in an apparently endless series of near-misses, or beaten to a pulp by the Bokke? So this was disappointing, but not too surprising. And there, perhaps, you have Wales's problem. They really don't surprise you. Their virtues and their limitations are well-established and they rarely seem capable of transcending either. Deprive them of a physical edge and they struggle, as both England and Ireland proved last season. And is there any opponent against which it is harder to gain a physical edge than South Africa ? Which is not to say that this was a simple battle of blunderbusses. Anyone who thought they'd wait a long time to see as complete a full-back display as Ben Smith's effort for the All Blacks at Dunedin had, assuming possession of the right TV channels, only a few hours to wait before Willie le Roux was unleashed in Durban. There are undoubtedly some very fine full-blacks playing international rugby at present. But one of Wales's problems is that their kicking game seems to bring out the best in them. Mike Brown looked like the second coming of Serge Blanco at Twickenham in the spring. Dan Biggar was one of the few Welshmen who could take some satisfaction from the afternoon. His two drop goals, particularly the second, fashioned from a low pass, were taken with cool precision. But Wales's restarts too often saw Victor Matfield taking the ball unchallenged and with time and space to move and their tactical kicking was a springboard for Springbok counters rather than a means of exerting pressure. And Wales simply can't afford to give good teams opportunities. The record since Gatland took over shows that in 44 matches against the southern trio and in the Six Nations against France, Ireland and England they have scored 56 tries - an average of just over one and a quarter per match. That doesn't leave much margin for defensive fallibility. 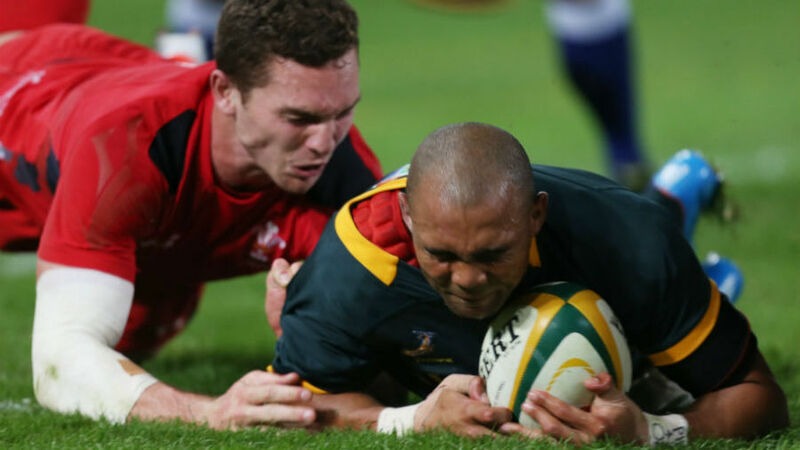 And once Bryan Habana had made his early incision and the Boks had taken ruthless advantage of Wales's short-handedness following Jamie Roberts' sin-binning - fair sanction for an action which was ill-judged but certainly not malicious - there was no way back. There were some small Welsh satisfactions. Gatland's contribution to British rugby as a whole richly merits his OBE. Adam Jones similarly fully deserves his century of caps, and no player has ever merited a warmer welcome back than Matthew Rees. Wales at least did not quit, and had the satisfaction of ending the scoring with that long-range effort from Alex Cuthbert. There was also some promise in the debuts of Gareth Davies and that most welcome of final trial bolters, Matthew Morgan. South Africa were pretty sated by the time they came on, so it is hard to know how much to make of their contributions in the last 15 minutes. But there was at least a sense of quick thought and movement during that period absent when most Welsh possession was emerging slowly, shipped laboriously by Mike Phillips and disappearing into Bokke cover in the hands of the endlessly willing but predictable Roberts. South Africa are formidable opponents - and any national team in the world would be diminished by the absence of Leigh Halfpenny and either/both of Sam Warburton and Justin Tipuric. Were Wales by some miracle able to field a 25 year old Gareth Edwards, Barry John, JPR, Gerald Davies and Merv the Swerve at Nelspruit next week, they'd probably lose. That group did not after all ever manage as Wales to beat either the Boks or the All Blacks. But it might just be worth considering a thought from the cunning old devil who coached that group in the 1970s. Clive Rowlands knows scrum-halves as few others do, and he likes Mike Phillips. But he thinks that Wales should field quick hands at No.9 from the start, then use Phillips as an impact option rather than, as at present, the other way round. There's surely a similar case for one or both of James Hook and Morgan. Some will object that Wales would surely be hammered. So they may be. But that's also what happened today with the tried and tested option. Wales can, and possibly will, continue to run in straight lines into a large and extremely unyielding green-shirted brick wall. But after 19 consecutive defeats by the southern big three, is there anything to be lost by trying something different?